← Earl Ball Gives us an Onsite Report from the 2018 FSA MASTERS!! John Brown’s Newspaper Article: 2018 04 03. John Brown Gives His End of Season Report!! Lois Wegner of Tri-Par Estates in Sarasota won first in the Ladies Pro Masters. Lois credits her late husband Al Wegner for talking her into trying shuffleboard 20 years ago. She loves the outdoors and thrives on competition. She also appreciates the love and care shared by others in this sport. Cheryl Putnam of Trailer Estates and Caro, MI placed second in her first year as a Pro. She also won 1sr in Michigan Amateurs in 2017, and is an officer at both Trailer Estates and Caro. Evelyn White of Ridgewood placed third. She and her late husband Raeburn enjoyed shuffling together for a long time, and she carries on their long tradition with grace yet today. Arlene McCague of Palmetto Shuffle Club placed fourth. A perennial contender, Arlene plays well every week and represents her club with honor. Pat Tomko, fifth , plays out of Bradenton Shuffle Club where she is a Vice-President. A retired widow from Maine, she enjoys meeting the amateurs, enjoys the “shuffleboard family” and looks forward to next season. Linda Wallingford, sixth, made State Am in 2009 and Instant Pro in 2010. She often partners with her husband, Vern, also a faithful competitor. Shirley McCullough, seventh, of Trailer Estates and MI, is a member of the Florida Shuffleboard Association Hall of Fame, and veteran shuffler. Eighth place was shared by Marlene Coburn of Trailer Estates and Alternate Judy Cross who finished the last two days. Faren VanDeGrift of Bahia Vista Estates placed first in the Men’s Division. Faren has been a strong contender for many years and we are all proud of his win. 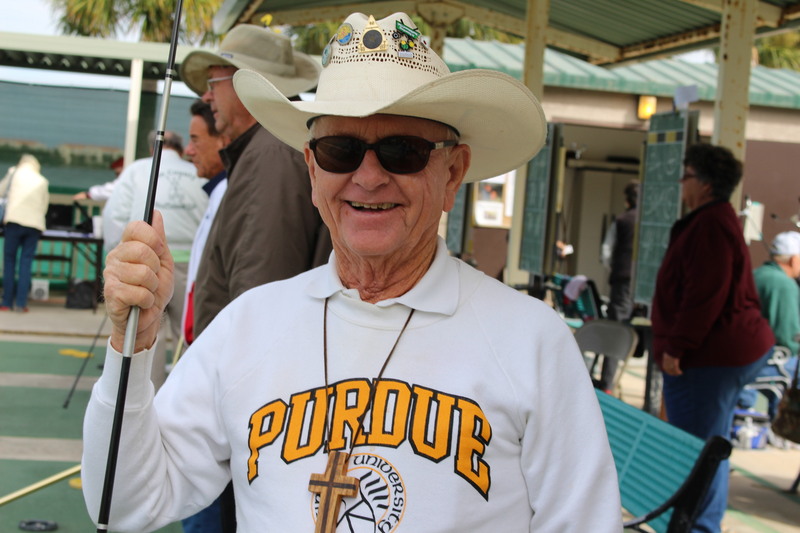 Second place won by Jim Miller of IN and Bradenton Shuffle Club, who will play in the Florida Masters again this year. Jim will be accompanied by Tournament Director Jo Miller at the Florida Masters this week. Bob Kendall, third, is from MI and Braden Castle. He loves to shuffle and is seldom absent from competition. Fourth is Ron Nurnberger of Bradenton Shuffle club, who is a past president of the SWCD and who will again play in the FSA masters. Fifth was won by Ralph Lozano of Golf Lakes with the unlikely nickname of Tiny, who plays long and well in competition each season. Sixth is Grant Childerhose of Golf Lakes, who also helped a lot at his home club, and plays often in their Tuesday night mingles games. Seventh place is Dwayne Cross of MI and Bradenton Shuffle Club. Dwayne and Judy travel and play together and are well respected wherever they go. Eighth went to Larry Taylor who is a solid player with much ability and success over the years. Judy Taylor often helps him keep track of his cues and much else. John Mickle, now Past President of Trailer Estates Shuffle Club served faithfully as Alternate. John is from Hamilton, ONT, Canada. FL P-26 Tournament of Champions at Sebring March 26-27. Men Walking: Main 1. Jim Miller. Consolation 4. John L. Brown. Ladies Non-Walking Main: 2. Cheryl Putnam. Consolation: 2. Pam Nurnberger, 3. Terri Smith. Today is the second day of Florida Masters at Hawthorne located 3 miles south of Leesbug on US 27. Five contestants are from Southwest Coast District: Jim Miller, Ron Nurnberger, Dave Kudro, Pam Nurnberger and Terri Smith.
. Jim Clark, long a competitive shuffler in the SWCD and a faithful volunteer at Pirates Baseball in LECOM Park, suffered a fall at the dugout on Saturday, March 24. Tragically, he required serious surgery as a result, and was unable to recover passing away early last week. Jim loved our game and baseball and will be sorely missed by many.